OneWest Bank, the mortgage servicer previously owned by Treasury Secretary Steven Mnuchin, has been accused by homeowner groups of a type of foreclosure abuse involving lender-placed, or force-placed, insurance. Mortgage servicers are able to force insurance policies on homeowners during a lapse in coverage, when premiums haven’t been paid or the homeowner has no hazard insurance. Sometimes force-placed policies stem from changes in flood maps or other risks from catastrophic events. Numerous class actions accused mortgage servicers during the 2010 foreclosure crisis of forcing expensive LPI policies on homeowners, when those policies weren’t necessary. Many banks entered into large-scale settlements for abusing LPI, sometimes worth billions of dollars. But OneWest, which was bought by CIT Group Inc., avoided prosecution and class action settlements. Documents obtained by Bloomberg BNA show that OneWest attempted to levy LPI policies costing more than $10,000 for coverage from “hurricane-wind” damage, over nine times the nationwide average for fire and homeowner’s insurance, according to numbers from the National Association of Insurance Commissioners. The lack of successful large-scale class actions against the bank involving lender-placed insurance is another example of OneWest regularly avoiding penalties for its actions during the foreclosure crisis. OneWest was accused of being a “foreclosure machine” by homeowner advocacy groups like the California Reinvestment Coalition for a wide range of activities including robo-signing documents, dual-tracking foreclosures, and backdating documents. 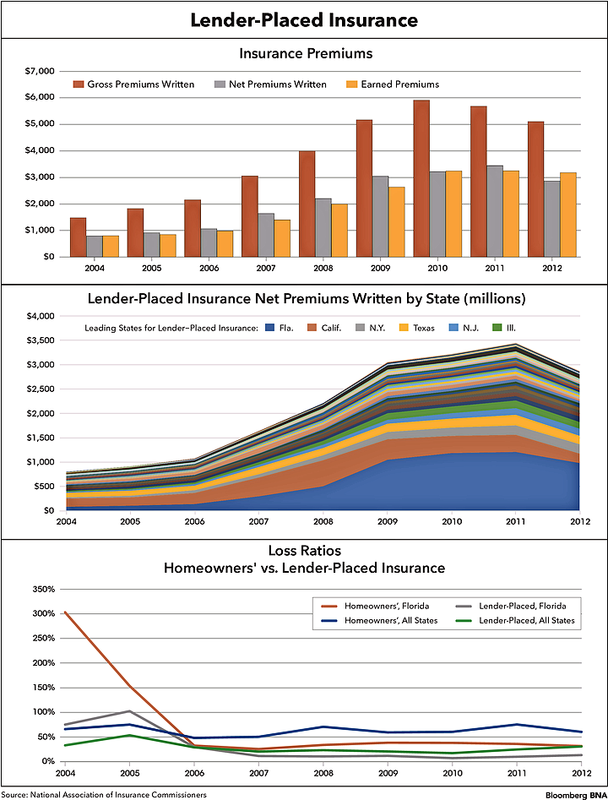 During the mortgage and foreclosure crisis, the number of force-placed insurance policies rose sharply, particularly in Florida. A 2015 report from the Government Accountability Office (GAO) found that LPI is used most often on borrowers without escrow accounts who have stopped paying insurance premiums, but is also common with mortgages that are delinquent or in foreclosure, as was the case for many homes during the crisis. Mississippi Insurance Commissioner Mike Chaney told Bloomberg BNA that "[LPI] is directly correlated with mortgage foreclosures” because mortgage contracts give the lender the right to force-place hazard insurance. “In short, lender-placed insurance became more prevalent during the 2007-2008 financial crisis because more people stopped paying their mortgages,” he said. Birny Birnbaum, director for the advocacy group Center for Economic Justice, told Bloomberg BNA that the average loss from LPI policies is half that of homeowner’s policies and therefore less risky, and the lower risks don’t justify the high costs associated with those plans. But besides the lack of risk, Birnbaum added, LPI is also cheap for insurers to provide. “It’s less comprehensive than homeowner’s insurance and the insurers save on the lack of underwriting. For a homeowner’s policy, the insurer needs to inspect the property, research prior claims and research the borrower’s credit history. It’s an expensive process,” he told Bloomberg BNA by phone. According to Birnbaum, even in the midst of major catastrophic events in 2011 and Hurricane Sandy in 2012, loss ratios for LPI remained low for the period despite homeowner’s insurance not covering flood damage. Numerous banks and surplus-line insurance companies like QBE Insurance Group Ltd. and Assurant Inc. were found guilty of force-placing excessively expensive policies when they weren’t necessary. Sometimes the policies cost ten or twenty times a normal policy, or backdating policies that would lead to more penalties. Banks and the insurance companies were simultaneously brought up on RICO charges for coordinating kickbacks related to the policies: mortgage servicers would coordinate levying lender-placed insurance on homeowners and the insurance companies would pay kickbacks to the servicer as commissions. JPMorgan Chase, Wells Fargo, PNC Financial Services Group, Inc., HSBC Holding PLC, Bank of America Corp. and U.S. Bank all entered into large-scale class action settlements involving various accusations, but OneWest, a major servicer, avoided class action prosecution. In October 2011, the New York Department of Financial Services opened an investigation into collusion between insurers and mortgage servicers related to lender-placed insurance, after receiving complaints from consumer advocates that LPI loss ratios were significantly lower than loss ratios for borrower-purchased insurance. But the Department of Financial Services confirmed to Bloomberg BNA that OneWest was never part of the investigation. In 2013, the department reached settlements with the largest LPI insurers—Assurant, QBE, and Balboa—but no mortgage servicers were included in the settlement. All individual cases against OneWest were either dismissed or settled out of court. The bank has been part of hundreds of individual cases that were settled out of court but attempts to discover the details of the settlements have been limited by confidentiality requirements required of the plaintiffs, Sean Coffey, communications manager with the California Reinvestment Coalition, told Bloomberg BNA. The bank has been part of three separate class actions over abuse of force-placed insurance, and two of those have been dismissed. The third case, Wieck v. CIT Group, Inc., Haw. Dist. Ct., 1:16-cv-00596 , is ongoing in Hawaii district court. Sandy Jolley, a reverse mortgage suitability and abuse consultant who testified at the Mnuchin confirmation hearings, provided Bloomberg BNA with numerousexamplesof letters sent by OneWest’s subsidiary, Financial Freedom, indicating that policies would be forced on homeowners sometimes at a cost of more than $10,000 a year for “hurricane-wind” protection. The Melodie Meyer v. OneWest Bank, FSB, et al, N.D. Cal., 15-55596, 4/20/15 class action case was dismissed because OneWest claimed preemption from state regulations because it was a nationally chartered bank, according to Catherine Anderson, an attorney with Giskan Solotaroff & Anderson LLP arguing the Wieck case. A representative from CIT Group, which acquired OneWest in August 2015, declined to comment. Anderson added that there are numerous issues that make lender-placed insurance particularly confusing. She pointed to the Wieck case, in which the plaintiff claimed the bank backdated a policy for “windstorm-hurricane” insurance even though the plaintiff already had hazard insurance. While preemption was used to dismiss the class action in California, “that opinion might not apply in a different district,” Jeffrey Golant, lead attorney with the Law Offices of Jeffrey N. Golant, P.A., in Florida told Bloomberg BNA. Golant specializes in wrongful foreclosure and borrowers’ rights. Golant added that force-placing insurance is part of a suite of abuses that continue to occur throughout Florida, like servicers demanding a certificate of occupancy from reverse mortgagees. If the resident neglects to return the certificate, mortgage servicers will send process servants to start the foreclosure process because the occupancy is not that of the borrower, according to Golant. “As part of the foreclosure process, the process servant may obtain a signature from the resident at the same location they are calling unoccupied,” he said, showing that the foreclosure process was unwarranted. Following the fallout from the foreclosure crisis, numerous agencies attempted to rein in the lender-placed insurance industry. In 2013, the Federal Housing Finance Agency pushed Fannie Mae and Freddie Mac to prevent mortgage servicers from receiving commissions related to LPI policies. In 2014, the Consumer Financial Protection Bureau updated mortgage servicing rules, known as Regulation X, with provisions from Dodd-Frank to protect homeowners from LPI abuse.